The incredible true story of how that happened is told in the hit feel good movie of the year Fisherman’s Friends, starring Daniel Mays, James Purefoy, Tuppence Middleton and Noel Clarke with cameo appearances from the group whose voices also appear on the soundtrack. What’s more, in an incredible twist of fate, Pete Hicks who appears in the on-screen Fisherman’s Friends has now joined the actual line up and will be out on tour with the boys this autumn. The new film will be released in cinemas across the UK on Friday 15th March. “Singing live is what we’re all about, it’s why we started the group in the first place,” says MC and bass man Jon Cleave, instantly recognisable from his extravagant moustaches. Released alongside the Fisherman’s Friends film, the group’s latest album Keep Hauling album features 17 sea shanties – some old, some new and some slighty blue. 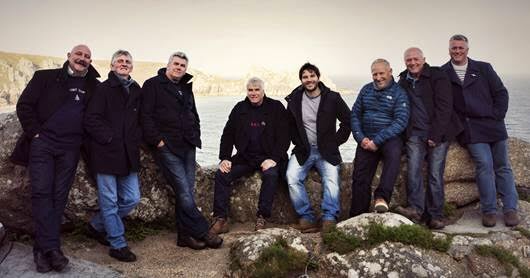 Cornwall’s best-known musical export, the Fisherman’s Friends have also been the subject of an ITV documentary, released the hit albums One and All (2013), Proper Job(2015) and Sole Mates (2018) and every year play to tens of thousands of fans at home and abroad. Heading out on a huge UK tour this autumn expect a fresh catch of shanties and songs of the sea as well as a net full of nautical nonsense from Cornwall’s Saltiest Sea Dog singers.